Just 75 miles (120km) from Cape Town, Langebaan languished for years in relative obscurity, remaining an excellent retirement destination and a popular place for local fishing enthusiasts to spend the weekend. 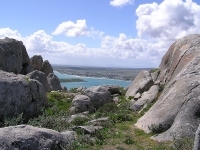 However, in recent years, picturesque Langebaan has been getting the attention it deserves and has become a frequented West Coast tourist destination, offering an incredible range of fun water sports and adventure activities, as well as top-class beach resort accommodation and a winning selection of restaurants and shops. The water in the Langebaan Lagoon is warm enough to swim in all year round. The most popular water sport activities in Langebaan include sailing, kayaking, kitesurfing, waterskiing, and fishing, while the town's upmarket resorts also offer quintessential vacation amenities like golf courses, swimming pools, and tennis courts. Langebaan is also the ornithological capital of South Africa, boasting over 300 species of birds, most of which can be viewed in the nearby West Coast National Park. Exploring the national park is a must when in Langebaan, as this is the best place to experience the unspoilt and unusual landscapes of this beautiful area.